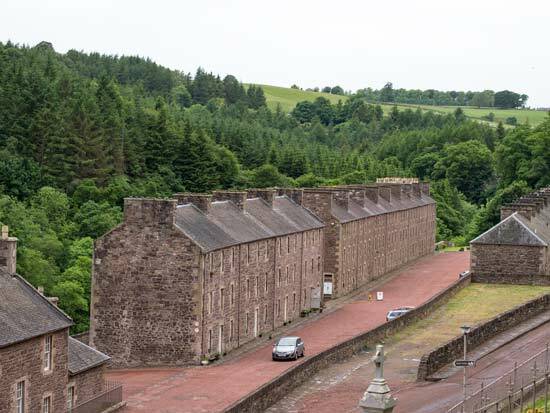 We visited New Lanark yesterday. It’s about 30 miles south east of Glasgow, on the River Clyde. 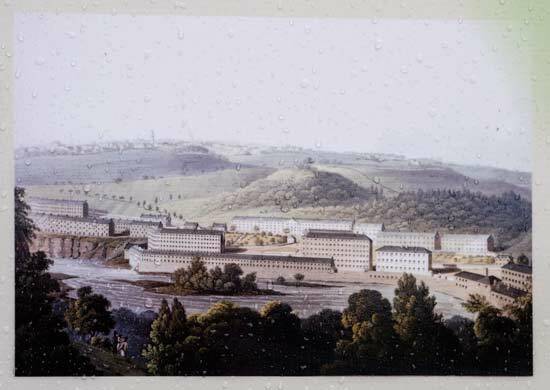 It was designed as a model village by Robert Owen, a mill owner. The power for the mills came from the waterfalls and the force of the river, and because New Lanark is now a World Heritage Site, it has a page on Wikipedia and you can read all about it there. I thought the village looked terribly regimented and unappealing. And there was – it seemed to me – more than a touch of the patronage of the mill owner to his workers. That rubs up against the fact that Robert Owen was a social reformer and the standard of housing in the village may well have been streets ahead (pun) of other houses in Scotland. The thing is that I have just seen The Spirit Of ’45, Ken Loach’s film about the spirit that inhabited the working people of Britain in 1945 when the Second World War ended. I know the history of the period, so the film didn’t surprise me. But one thing did catch me. And that is that I have hitherto disliked with all my heart and soul, the design of a lot of post-war housing. I know they are well built. And after spending a year in South America and then coming back to England, I realised then that England is wonderland. It is a wonderful place. Every line of every wall that should be vertical, is vertical. It looked like Legoland in its perfection compared where I had been. I had culture shock coming back to England, where people seemed not to realise in what a wonderful dream of a country they were living. But of course, it is all relative. And the gripes about the unfairness of the system are real enough. But to get back to Local Authority housing that I disliked so much – after seeing The Sprit Of ’45 I saw it through the eyes of those who had been given clean, fresh, well-built new houses instead of the flea-infested and rat-infested, dark, damp slums in which they had lived.